Our address is 767 Eustis St., Suite 140, St. Paul, MN 55114. Note on directions: Currently Google Maps is sending people to the Sunrise Bank parking lot instead of the Case parking lot. Please use the directions below; do not use Google Maps. Note: If you are visiting United during one of our evening events, you may have access to the gated lot for students, staff and faculty. If the lot is available, that information will be shared on the event page on our calendar. In cases where the gated lot is available, please follow the directions for students, staff and faculty following these visitors’ directions. When driving south on Eustis from Franklin/University/280, go past the building to the visitor lot located on the south side. The gated lot that is before our building (on the north side) is for students, faculty, and staff. Case building from the north. 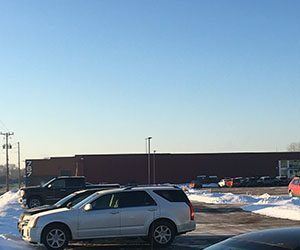 Drive past the north parking lot to the south side of the building. If you see this corner of the building as you drive south on Eustis, you are on the right track. View from the entrance to the visitor’s (south) parking lot. You’ve arrived! Our building is on the right. From the visitor’s lot, enter the building and head down the central atrium/hallway almost to the opposite end of the building. United is in Suite 140 on the left (west) side. When driving south on Eustis from Franklin/University/280, enter the gated lot that is before our building (on the north side). Unless the gate is open, you will need an ID to enter the lot. 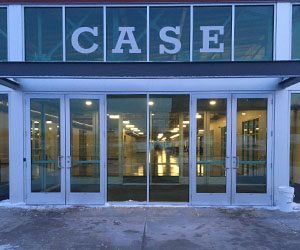 From the student and employee lot, use the main public entrance on the north side of the building (it says CASE above the doors). United is in Suite 140 on the right (west) side, not far from the entrance. Take exit 23A for MN-280. Take the Territorial Rd./University Ave. exit. Go straight. 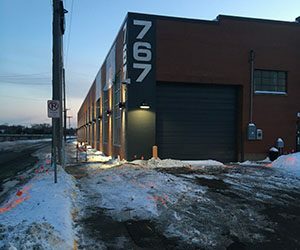 You will merge onto Eustis St.
Cross Territorial Rd., University Ave., and Franklin Ave. Our building will be on the right — look for the large red building. Visitors are asked to park on the south side of the building. Take exit 16B to merge onto I-94 E toward St. Paul. Use left lane to take exit 236 for MN-280. Keep right. Follow signs for University Ave. and merge onto Cromwell Ave. Turn left onto Eustis St. Our building will be on the right — look for the large red building. 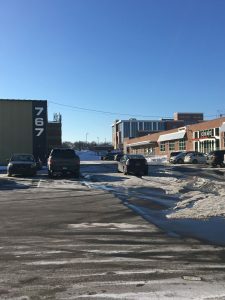 Visitors are asked to park on the south side of the building. Take exit 236 toward University Ave. If taking Metro Transit, the closest light rail stop is the Westgate Station on the Green Line. We also are near bus routes 63, 67, 87 and 30. 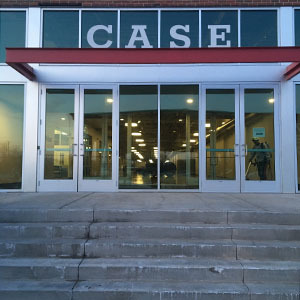 Use the main public entrance on the north side of the of the building (it says CASE above the doors). United is in Suite 140 on the right (west) side, not far from the entrance. If you use public transportation, the north entrance will be closer to your stop.